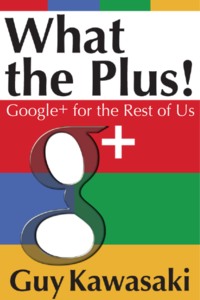 I'm figuring you already read Guy Kawasaki's new book What the Plus, Google+ for the Rest of Us, but if you've been too busy to grab a copy, check it out here on Libboo. Also thanks Guy for the mention in your interview in Social Media Examiner. We had a great time seeing you (and hearing you speak) at SXSW! Here's a little bit of the interview to get you interested. The link to the full piece is here.